Happy New Year! Do you all have any fabulous food traditions for the New Year? I chose to stick with my Italian roots… or root… and opted for a steaming bowl of lentil soup on this freezing first day of the new year! The inspiration for this lentil soup comes from la mamma Italiana and my year as an exchange student in Siracusa, Sicily. The highlight of my year was definitely my amazing host family, but the incredible food was a close second. I realize lentil soup may not be what traditionally comes to mind as you think of scrumptious Sicilian cuisine, but this is the perfect Mediterranean meal to warm up your winter! I was a bit skeptical at first too… I had not yet quite developed my love for legumes at 18, but trust me, this is delicious! This soup only takes a few minutes of prep work, before simmering on the stove, and it freezes great for weekday lunches or a midweek meal. Confession of a *wannabe* foodie…. Wow! It is tough to make lentils look appetizing in a photo! Thoroughly rinse and sort the lentils. Add the lentils and 8 cups of stock to a large pot over medium heat. Roughly chop all the vegetables and add them to the pot with lentils and stock. Add the 2 bay leaves and bring the soup to a boil uncovered. Once the soup is boiling, then reduce it to a simmer and cover, leaving the lid slightly ajar. Simmer for 45 minutes until the lentils and all the vegetables are tender. Puree the soup using an immersion blender or a traditional blender. Return the soup to the pot and season to taste with olive oil, salt and pepper. 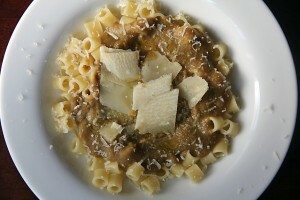 Serve the lentil soup over ditalini pasta and garnish with shaved parmigiano reggiano cheese and a drizzle of olive oil.